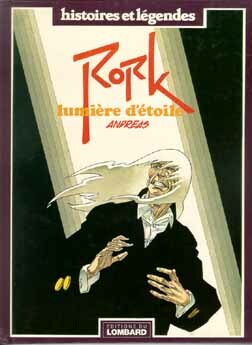 Rork is a white-haired "wizard" from another dimension who solves supernatural mysteries, before embarking on a quest to discover his origins. During his quest, he is assisted by a cast of characters including occult detective Raffington Event, astrologer Capricorn, the psychic Deliah Darkthorne (aka "Low Vallrey") and her daughter Sy-Ra, the immortal Yosta, and others. His enemies are the mysterious Pharass and the demon Dahmaloch. The first two Rork stories were originally serialized in "Tintin" in 1978., before being collected in the graphic novel format. 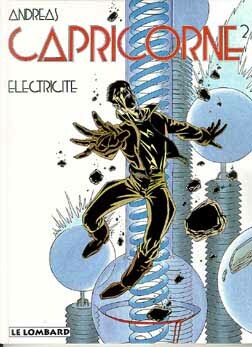 The other volumes were directly released as graphic novels. 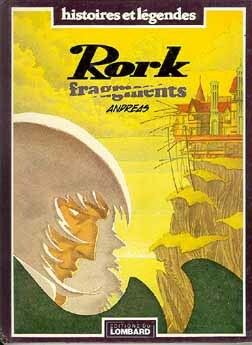 The first five Rork stories were translated by & Randy & Jean-Marc Lofficier. They were first serialized in b&w in Dark Horse's "Cheval Noir" comic, then published as graphic novels by NBM. FOR MORE ABOUT THE AMERICAN TRANSLATIONS OF RORK. 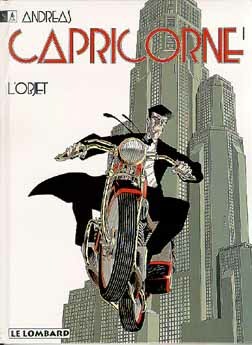 Capricorn is an astrologer and crime-fighter whose real identity is unknown. Ably assisted by librarian Astor and stunt flyer Ash Grey, Capricorn fights occult threats in the New York of the 1930s. His arch-enemy is the mysterious Mordor Gott. Note: Capricorn's encounter with Rork (in Rork Nos. 5 and 7) takes place between Volumes 4 and 5 of the series. 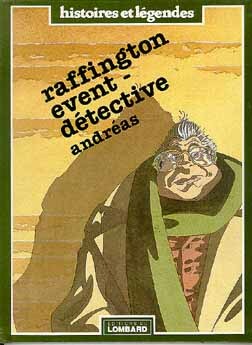 Raffington Event is a portly detective of the occult. He met Rork in Volumes 2 and 7 of the Rork saga. A native of Germany, Andréas (Andéas Martens (1951- )) studied at the St. Luc comics school in Belgium, assisting Eddy Paape on Udolfo, before relocating to France. His genre series include Arq, Cromwell Stone, Cyrrus, Rork and its spin-off, Capricorne, as well as a number of single works such as La Caverne du Souvenir (The Cave of Memory), Coutoo, Dérives (Adrift), Aztèques, and Révélations Posthumes (Posthumous Revelations). Rork, Capricorne, Raffington Event © 2003 Andreas/Lombard. All rights reserved.